The Anthropocene, the geological age of humanity, is associated with a key feature: the power of technoscientific intervention into the Earth's environment. This transformative potential became apparent in the second half of the twentieth century when the science and the fiction of "terraforming", of turning extreme or extraterrestrial into Earth-like environments, gained traction. Hopes of venturing into Space became as pervasive as perceptions of humans overexploiting and polluting the Earth. The popular vision of settling sustainable communities on Mars saw an upswing in the recent decade of anthropogenic global environmental change. 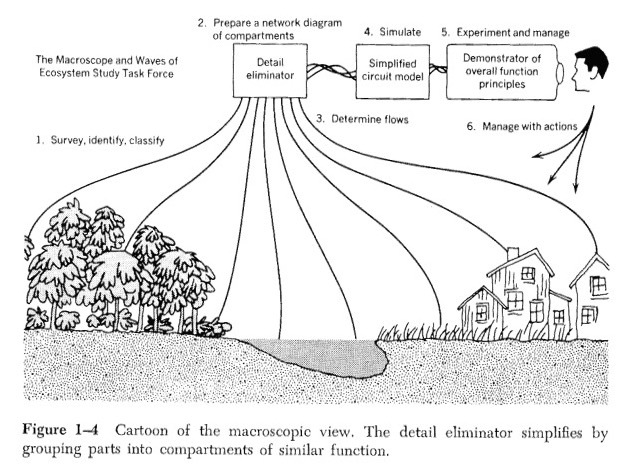 New York, Wiley-Interscience 1971, p. 10. This project explores the science and fiction of Mars settlement with the help of terraforming as a creation of new environments in Space as well as blueprints for the technological reconstruction of the Earth's environment. The aim is to describe the Anthropocene not simply as an epoch that endangers the Earth but primarily as an epoch that essentially transformed the understanding of life to a minimalist principle of survival through infinite metabolic conversion and technological substitution. This understanding conjoined images of recreation and creation, of paradisiacal pasts and eco-technological futures. Whether ‘postplanetary’ life, a life that is not tied to a specific planet but transcends planetary boundaries, will be possible and desirable may become one of the most challenging questions of our future. The project is carried out at KTH Royal Institute of Technology Stockholm. It is funded by the Swedish Foundation Riksbankens Jubileumsfond (2018-2020). Sabine Höhler, "Survival: Mars Fiction and Experiments with Life on Earth", Environmental Philosophy 14 (2017) 1, Special Issue "Immortality and Infinitude in the Anthropocene", eds. Michelle Bastian and Thom van Dooren, pp. 83-100. This project analyzes collecting and classification practices in the history of botany as technologies of conservation. From the taxonomies of the early modern age to biodiversity as the key to survival of life in the late 20th century, preserving and storing plant material has been essential to classification and conservation efforts. Nature conservation is most commonly associated with protecting nature from human-induced destruction, as in the case of biodiversity conservation. However, such protective measures are built on a number of conservation technologies: preserving objects through collecting, and stabilizing objects through classification. Living matter resists collecting and conserving; plants are constantly growing, hybridizing, adapting or withering away. Since the early modern period, increasingly sophisticated technologies have been developed to organize and preserve, transport and transcribe collected items. Accordingly, collections are perceived as giving accurate and representative accounts of natural order. We take a diachronic approach – from the beginning of the systematic collecting of plants for scientific purposes in the early modern period to the botanical databases of the present. Adopting a comparative perspective, we aim to understand the practice and the meaning of nature collections in shifting historical contexts. Studying the similarities and differences in epistemology, architecture, infrastructure and economy of collections we intend to show why and how projects of collecting and archiving nature became so central to projects of nature conservation. We will demonstrate that the meaning of conservation has reflected changing attitudes towards time and change. 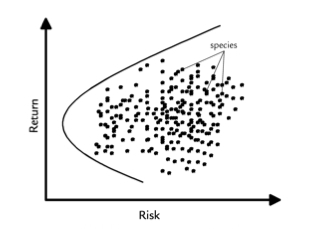 Applying Portfolio Theory to Biodiversity"
Biodiversity and Conservation 13 (2004) 4, pp. 827-849. 3. The shift to digital information technologies and the building up of database systems as tools of biodiversity management in the late 20th century. The project is an exploration into writing comparative history with the aim of enabling early modern and modern historians to mutually benefit from their specific knowledge and perspectives. We bring together expertise from across history of science, cultural history, literature studies, and museum studies. The project is carried out in cooperation with Anna Svensson at KTH Royal Institute of Technology Stockholm. The project is funded by the Swedish Research Council (2015-2017). Lea Haller, Sabine Höhler and Andrea Westermann (Eds. ), Rechnen mit der Natur: Ökonomische Kalküle um Ressourcen. Theme Issue Berichte zur Wissenschaftsgeschichte 37 (2014) 1. Sabine Höhler and Rafael Ziegler (Eds. ), Nature's Accountability. Theme Issue Science as Culture 19 (2010) 4. This project is about viewing Earth from a distance. Both the views from remote observation points and the resulting images are extraordinary. Since the 1960s we have been presented with awe-inspiring pictures of the entire globe taken from space. We tend to overlook, however, that elaborate sensing technology often mediates the long distances between the observer and the image. These distances are geographical as well as epistemic: Remote sensing technology does not "see" but perceive the Earth in complicated ways. Although the resulting images convey the coherence and completeness of photographic pictures they only emerge through intricate processes of translating large sets of discrete data into consistent visual formats. at a spatial resolution of 500 meters. Source: NASA Goddard Space Flight Center. The processes of generating, aggregating and translating data points into visual wholes are imbued with the ambitions, interpretations and applications of different actors in international and transnational settings. 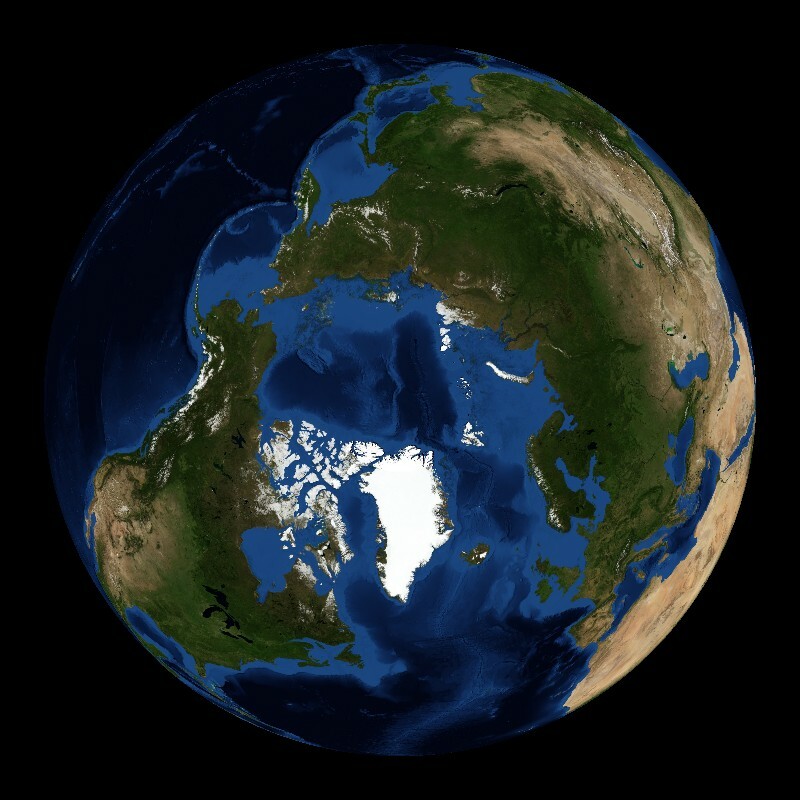 This project aims to disaggregate the Earth imagery of landmasses, ice, and seascapes. By analyzing the decisions, methods, funding and technologies which enter the assembling of such imagery we strive to explore and to explain the political and social conditions of translating situated observations into global images, and we also hope to elucidate their global consequences. The purpose is to analyze and explicate the introduction and use of remote sensing technologies to understand the Earth as a cultural and ecological system. The project describes and compares long-distance observation technologies that emerged in the second half of the twentieth century, primarily satellite systems and sonar systems, which are based on different technologies of perception. Yet these technologies are similar in roaming the earth's surface and sending data back to an observer, data that are converted and assembled into visual arrays. By exploring the Earth as an arrangement of such technoscientific representations we propose to take a new perspective on the global environment as it emerges from intricate chains of reference to display the Earth as a whole. 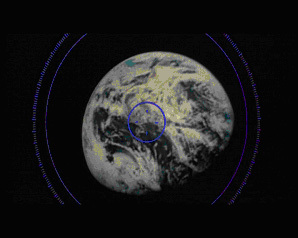 Science, politics and society increasingly refer to Earth imagery, often without being clear about how the images came into existence, what information they contain and what they claim to represent. A major focus of the project will thus be the growing reliance on such visual material and the high hopes placed on the visual tools they offer for recombining and territorializing the Earth's surface. Earth imagery not only structures what can be perceived as environmental problems, but also formats and thus preforms specific problem solutions. Such qualities are not technological but social and political and they need to be discussed in interdisciplinary perspectives. Three case studies cover different aspects of earth research – sea, ice and land – by different remote sensing tools. The cases look into different modes of operationality, different media involved (space, water, air), technologies (light, radio, sound), and transmissions between survey politics, data politics and politics of display. But the cases also inquire into the common features and encompassing themes of distance, mediation and emerging earthly environments. The project is carried out in cooperation with Nina Wormbs and Johan Gärdebo at KTH Royal Institute of Technology Stockholm. The project is funded by the Swedish Research Council (2013-2016). Sabine Höhler, "Local Disruption or Global Condition? El Niño as Weather and as Climate Phenomenon", GEO Geography and Environment 4 (2017) 1, Special Issue "Global Environmental Images", ed. Sebastian Grevsmühl (online open access, 11 pages). Blue Marble. Source: "Silent Running". Directed by Douglas Trumbull, starring Bruce Dern. Dieses Projekt untersucht die diskursformierende Kraft der Figur des "Raumschiffs Erde" im "Umweltzeitalter" der 1960er und 1970er Jahre. Es geht der These nach, dass das Raumschiff Erde nicht allein als eine Metapher für den fundamentalen Wahrnehmungswandel des irdischen Lebensraumes als geschlossen und endlich diente, sondern auch als Modell und Bauplan für eine spezifisch wissenschaftlich-technische Bewirtschaftung des Lebens in seinen natürlichen Grenzen. Unter der Prämisse, dass Raum eines der zentralen Themen des 20. Jahrhunderts darstellte, untersucht die Arbeit den Umweltdiskurs in der zweiten Jahrhunderthälfte hinsichtlich seiner Problembeschreibungen und Umgangsweisen mit räumlicher Begrenztheit. Das Raumschiff dient dabei auch als ein analytischer Begriff, um die Wahrnehmung der Endlichkeit und die Regime der Effizienz zu verschränken, die sich im Erddiskurs ausbildeten. Das Projekt geht der Figur des Schiffs in der westlichen Kulturgeschichte nach und verfolgt dessen Spuren im zeitgenössischen Umweltdiskurs von der Arche bis zum Rettungsboot. Schiffsnarrative von Eingeschlossenheit und Ausgeschlossenheit, von wissenschaftlicher Exploration und Expansion, von Übergang und Aufbruch, von Vertreibung und Selektion, sowie von Vergänglichkeit und Überleben bildeten den Hintergrund für die Autarkie und Steuerbarkeit, die das Raumschiff versprach, und ebenso bereicherten sie die Vorstellungen der Miniaturisierung und der Substitution der Erde in den Phantasien der Weltraumbesiedelung. Raumschiff Erde, so die These, markierte den Planeten als temporäre Umgebung und projektierte ein Überleben der Menschheit anderswo, gegründet auf rationale Planung sowie auf die optimale Kombination funktional zusammenwirkender technischer und natürlicher Einzelteile. New York, Universe Books 1972, pp. 91-92. Das Projekt zieht zeitgenössische Utopien und Dystopien in Science Fiction Filmen und Literatur ebenso heran wie verschiedene wissenschaftlich-technische Problembeschreibungen und Lösungsentwürfe aus den Bereichen Systemökologie, Humanökologie und Biosphärentechnologie, um übergreifende Motive wie Abgeschlossenheit, Kapazität, Gleichgewicht und Effizienz in den zeitgenössischen Debatten zum irdischen Lebensraum herauszuarbeiten. Diese Motive wiederum waren mit biopolitischen Maßnahmen verknüpft: auf das Leben gerichtete Technologien, die das Leben als quantifizierbar und inventarisierbar formten und auf räumliche Einheiten bezogene Grenzen berechenbar werden ließen. Um diese neuen wissenschaftlichen Zugriffe auf Natur und Leben auszuarbeiten geht die Arbeit erstens dem Wandel der Biosphäre von einem Behältnis des Lebens zu einem irdischen "Lebenserhaltungssystem" nach. Die Repräsentationen ökologischer Verhältnisse im "System Erde" zogen Optimierungsstrategien nach sich, mit welchen sich Wissenschaft und Technik als Problemlöser gerierten. 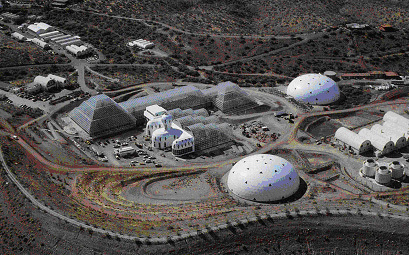 The Glass Ark: The Story of Biosphere 2, New York, Puffin Books 1991, p. 24. Zweitens nimmt die Arbeit die humanökologischen Rechenleistungen zur Begrenzung der Weltbevölkerung in den Blick. Für die Arithmetik und Ökonomie der "Überbevölkerung" wurde das Konzept der ökologischen "Tragfähigkeit" der Erde entscheidend. Drittens untersucht die Arbeit Ansätze der Simulation und Substitution des ganzen Planeten. Das Projekt der "Biosphäre 2" zielte darauf ab, einen zukunftsfähigen Surrogat-Lebensraum zu entwickeln, der als Prototyp einer Weltraumkolonie dienen sollte. Hier wurde das Raumschiff Erde als moderne Arche realisiert. "Spaceship Earth" was a key metaphor in the late twentieth-century debate over the world's resources and the future of humankind. This idea of the earth as a vessel in space came of age in an era shaped by space travel and the Cold War. The study innovatively brings together technology, science and ecology to explore the way this latter-day ark was invoked by politicians, environmentalists, cultural historians, writers of science fiction and many others across three decades. Sabine Höhler, Spaceship Earth in the Environmental Age, 1960-1990 ("History and Philosophy of Technoscience" Vol. 4), London, Pickering & Chatto 2015. This book was published by Pickering & Chatto Publishers . A paperback-edition was published in 2016 by Routledge (London/New York). 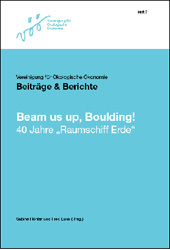 Publication: Beam us up, Boulding! 40 Jahre "Raumschiff Erde"
1966 formulierte Kenneth E. Boulding in seinem Aufsatz "The Economics of the Coming Spaceship Earth" seine Visionen zur Bewirtschaftung der Erde unter der Bedingung langfristiger weltweiter Ressourcenverknappung. Mit seinem Plädoyer für einen streng zyklischen Erdhaushalt innerhalb absoluter Grenzen brach er mit lieb gewonnenen westlichen Vorstellungen von unbeschränktem Konsum durch unerschöpfliche Rohstoffquellen und unendliche Möglichkeiten der Entsorgung von Wohlstandsabfällen. Sein Appell entfaltete weit reichende Wirkung. Zugleich zeigt die Betrachtung des Umweltdiskurses seit den 1960er Jahren, dass Begriffe wie Wachstumsgrenzen, Nachhaltigkeit oder eben das "Raumschiff Erde" kontingente Problembeschreibungen sind, die bestimmte Dinge in den Blick rücken und andere ausblenden. Zum vierzigjährigen Jubiläum wird mit diesem Heft erstmals eine deutsche Übersetzung des Textes von 1966 sowie eines Nachworts von Boulding, "Spaceship Earth Revisited" von 1980 vorgelegt. Drei Kommentare ordnen die Texte historisch und theoretisch ein: Blake Alcott führt aus, welche Bedeutung die Vorstellung natürlicher Expansionsgrenzen für den ökonomischen Diskurs gewonnen hat. Fred Luks nimmt eine ökonomisch-theoriegeschichtliche Einordnung des Raumschiff-Textes vor. Er erläutert Bouldings Platz im ökonomischen Diskurs und betont die Bedeutung, die sein Werk im Allgemeinen und der Raumschiff-Text im Besonderen für die Entwicklung der Ökologischen Ökonomik hatten. Sabine Höhler interpretiert die Figur des "Raumschiff Erde" kulturgeschichtlich als einen Mythos des Umweltzeitalters, in dem sich Fortschrittshoffnungen und Zukunftsängste verbinden ließen. Sie geht insbesondere den Implikationen der Funktionalität, Selektivität und Ortslosigkeit des Raumschiffbildes nach. Sabine Höhler and Fred Luks (Eds. ), Beam us up, Boulding! 40 Jahre "Raumschiff Erde"
(Special issue on the occasion of the fortieth anniversary of Kenneth E. Boulding's "The Economics of the Coming Spaceship Earth", 1966), Vereinigung für Ökologische Ökonomie, Beiträge und Berichte No. 7 (2006), ISBN 978-3-9811006-1-7, 59 pages. Online-edition of the theme issue on the webpage of the Vereinigung für ökologische Ökonomie e.V. 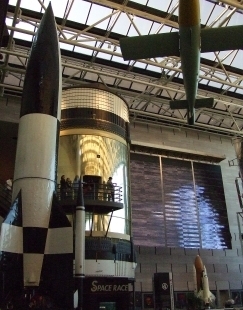 National Air and Space Museum, Washington, DC. "How can the human race survive the next hundred years? In a world that is in chaos politically, socially and environmentally, how can the human race sustain another 100 years?" Mit dieser Frage im Internet-Forum Yahoo! belebte der britische Physiker Stephen Hawking im Sommer 2006 die Debatte um die Kolonisierung des Weltalls. Angesichts von Viren, Terror und Kriegen, schwindenden Ressourcen, Umweltverschmutzung und globaler Erwärmung sei die Zukunft der Menschheit langfristig nur zu sichern, wenn sie in das Weltall ausschwärmte und andere Planeten kolonisierte. Dazu seien die Menschen soweit zu adaptieren, dass sie als neue Gattung des homo spaciens auf anderen Planeten überleben könnten. Das Projekt untersucht die Konzeption und Realisierung von experimentellen Laborumwelten in der zweiten Hälfte des 20. Jahrhunderts. Es geht der Experimentalisierung von Lebensräumen im Zusammenhang mit Vorstellungen des "Lebenserhalts" nach und fragt nach den neuen Lebens- und Überlebensprinzipien, die dabei Raum greifen. Wohl nicht zufällig verwendete Hawking die Verben "aufrechterhalten" und "überleben". Diese Begriffe sind uns aus der medizinischen Praxis geläufig, wo Körperfunktionen durch lebenserhaltende Maßnahmen klinisch stabilisiert werden. Technische Lebenserhaltungssysteme sichern aber auch das Überleben in abiotischen Umwelten, in denen menschliches Leben nicht vorgesehen war. Unterseehabitate und Weltraumstationen bilden hierfür nur die bekanntesten Beispiele. Insbesondere die Raumfahrt wurde und wird häufig als eine Exit-Strategie betrachtet, um anderswo ökonomischere, resistentere und nachhaltigere Lebensräume zu schaffen als diejenigen, die den Menschen heute zur Verfügung stehen. Das Projekt erforscht, in welcher Weise die Idee und Technik des "Life Support" sowohl die Lebensbedingungen in Raumlaboren als auch die Wahrnehmung des endlich gedachten irdischen Lebensraumes ausrichtete. Nach dem Zweiten Weltkrieg verfestigten sich als grundlegend erachtete Funktionen des Überlebens nicht nur in der Semantik und der Technik der Raumfahrt, sondern auch in der Systemökologie. Seit der Umweltrevolution hängen wir alle an der Lebenserhaltungsmaschine des Blauen Planeten, der wie ein Raumschiff in der absoluten Leere des Weltalls zu schwimmen scheint. Leben stand von nun an in direkter Abhängigkeit zu den bedrohten Lebenserhaltungsfunktionen der Umwelt; das "Überleben der Menschheit" wurde zu einem zentralen Topos. Die Auffassung der irdischen Biosphäre als gigantische Intensivstation, so die These des Projekts, definierte in der Konsequenz das "Überleben" als ein experimentelles, technisch aufrechterhaltenes und zugleich suspendiertes Leben im permanenten Übergang. Official Symbol of the New York World's Fair 1964/65. Source: New York World's Fair 1964/1965. Time-Life Books, New York 1964, p. 178. Globalisierung ist kein Gegenwartsphänomen. Die "ganze Welt" hatte bereits um 1900 Konjunktur, als Weltreisen und Weltverkehr den Globus zugänglich und erfahrbar werden ließen. Vor diesem Hintergrund lässt sich die Geschichte des 20. Jahrhunderts als eine Geschichte räumlicher Wahrnehmung und geographischen Wissens schreiben. Der Band Welt-Räume. Geschichte, Geographie und Globalisierung seit 1900 entstand in Zusammenarbeit mit Iris Schröder (Humboldt Universität zu Berlin) und erschien im Frühjahr 2005 bei Campus in der Reihe "Historische Studien". Er greift die derzeitige Konjunktur des Raumes in den Kulturwissenschaften und der kritischen Geographie auf und entwickelt eine erst neuerdings im deutschen Sprachraum geführte Diskussion über Globalität und eine neue Globalgeschichte weiter. In Beiträgen aus Geschichte, Wissenschafts- und Geographiegeschichte untersucht dieser Band, wie Wissen und Wissensformen in globalem Maßstab hervorgebracht und legitimiert wurden, und wie in diesem Zuge die Erde als eine räumliche Einheit erfahrbar und wahrnehmbar wurde. In einleitenden und ausblickenden Aufsätzen legen die Herausgeberinnen einen umfassenden Überblick über unterschiedliche Ansätze einer Geschichte des Raums und eine Programmatik für eine Geschichte der Globalität im 20. Jahrhundert vor. Die Autorinnen und Autoren zeigen dann an Beispielen, wie die Erde vermessen, erfasst und organisiert wurde; sie tragen damit zu einem historisch fundierten Verständnis gegenwärtiger Weltordnungen bei. Iris Schröder and Sabine Höhler (Eds. 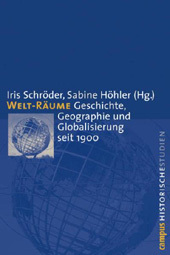 ), Welt-Räume: Geschichte, Geographie und Globalisierung seit 1900 ("Historische Studien" Vol. 39), Frankfurt/New York, Campus 2005. The Principle of Direct Echo Sounding. This project investigated the scientific and technological conceptualization and colonization of oceanic space in 19th and 20th-century oceanography. Addressing the question how the oceans from plane surfaces changed into volumes of evident spatial dimensions, sounded and charted in processes of deep-sea research, the project sought to contribute to current approaches to the history of spaces as objects as well as effects of scientific knowledge production. Moreover, it aimed at providing new insights to the question of the scientific and technological perception and representation of abstract spatial entities denying access through direct observation. Starting point was the international onset and organization of oceanographic research projects, which explored the deep sea from 1850 onward as part of the imperial ventures of their time. The aim was to show how, in the course of a century, the opaque ocean of the mid 19th century was densely depicted in physical terms and transformed into a technically and scientifically sound oceanic volume. Perceived through remote investigation, ocean space had to be based on an archival construction, that is, on information accumulating in a combination of conceptual, pictorial, and technological depth performance. Single measurements were arranged into profiles and contour line charts. In a first step, the fabrication of ocean space was investigated focusing on the wire sounding routines of oceanographic expeditions. The project explored how depth became a matter of scientific definitions, systematic measurements, and graphic representations. Resembling a narrated or written story, the argument was that the texture of ocean depth depended on the richness and coherence of its plots. Morphological West-to-East Profile of the North Atlantic Ocean. Vol. 2: Hans Maurer, Die Echolotungen des "Meteor", Berlin/Leipzig, de Gruyter 1933, supplement XXIX. In a second step, the project attended to the beginning of intensive oceanographic research initiated in the 1920s by the "German Atlantic Expedition" (1925-1927), one of the prestigious projects of the "Notgemeinschaft der Deutschen Wissenschaft", the German association promoting the sciences after World War I. The expedition aboard the Meteor became famous for systematically sounding and charting a large part of the South Atlantic Ocean's floor. Also, it was the first expedition to make extensive and systematic use of the technology of acoustic sounding. Whereas oceanographers' use of line and lead had depended on the solidity of physical, tactile reaching to the ground, taking bottom samples and measuring the length of paid out wire, acoustic sounding instruments developed after the First World War materialized the oceanic volume differently. Relying crucially on the water volume as a body of acoustic properties, echo time measurement provided a means of multiplying the number of deep-sea echo soundings to quasi-infinite density: sounding frequency became the measure of space gained. Focusing on two examples of the Meteor's depth charts, the profile and the bathymetric chart, the project argued that these visualizations of ocean depth not only claimed to be evidence of Germany's unbroken scientific excellence; they also acquired symbolic meaning within the German after-war struggles to regain lost colonial territory. The depth profiles and charts created public space for the revaluation of the German nation by visually constituting a new spatial realm of German influence. Coherent and authentic pictures developed from single depth measurements allowed for conceptualizing the abstract data volume of oceanographic space in terms of newly procured national grounds. Der "Traum vom Fliegen", Mythos der Hybris ikarischer Selbstüberhebung und daedalisch-kreativer Meisterschaft, gilt als charakteristisches Motiv des fin des siècle. Die Luftfahrt war "modern": Sie war sowohl revolutionäres wissenschaftlich-technisches Projekt als auch Emblem für die kulturellen Turbulenzen und Ambivalenzen der Epoche. The Ascend of the "Humboldt"
Berlin, A. Schall 1909, insertion between pp. 240 and 241. Die Arbeit untersucht die Genese des Forschungsfeldes Luftfahrt um 1900 als Teil der Luftfahrtbegeisterung der Moderne. Sie stellt die Wissenschaften im Ballon in Deutschlands Luftfahrtvereinen der 1880er Jahre in das Zentrum eines modernen Luftfahrtmythos, nach dem die Befreiung des Menschen von der Erdenschwere sowohl technisch aus eigener Kraft, als auch mittels der rationalen Produktion von Wissen über den Luftraum vollbracht wurde. "Luftfahrtmythen", so die zentrale These, waren mit ihrer technischen Realisierung nicht überholt, sondern wiederholten sich in der Luftfahrtforschung und Luftfahrttechnik. Im Konzept des Mythos verbindet die Arbeit die Ambivalenz von Fiktion, Konstruktion und Realität von Weltentwürfen. Mythen, semiotische Konstruktionen wie kulturell tradierte Narrationen, formulieren "Wahrheiten" und konstruieren sie zugleich wirksam. Im ersten Teil der Arbeit wird das Spannungsverhältnis von Mythos und Moderne anhand des "Traums vom Fliegen" untersucht. Flugmetaphern und -phantasien in Kunst und Literatur der Jahrhundertwende werden mit den technischen Luftfahrtkonstruktionen sowie der entstehenden Luftfahrtforschung konfrontiert. In der Flugsehnsucht, so das Argument, verbanden sich Vorstellungen der Aneignung göttlicher Macht zur Befreiung der Menschen aus seiner Erdgebundenheit und der Befreiung von den gesetzten Schranken der Natur durch wissenschaftlich-technisches Fortschreiten. Entlang der Rezeption der daedalisch-ikarischen Mythologie um 1900 wird der Begriff des "Luftfahrtmythos" formuliert und argumentiert, dass die Hybris ikarischer Selbstüberhebung und daedalisch-kreativer Meisterschaft insofern als charakteristisches Motiv der Moderne gelten kann, als sie den kulturellen Turbulenzen des fin de siècle Sinn und Ausdruck verlieh. Luftfahrtversuche waren heroische Versprechen moderner Naturwissenschaft und Technik, das Unmögliche zu vollbringen. Zusammengefasst zeigt dieser Teil der Arbeit, dass Luftfahrttechnik um 1900 nicht eine Realisierung des Luftfahrtmythos war, sondern eine Form seiner Neuerzählung. Im zweiten Teil der Arbeit werden die Luftfahrtvereine der Jahre 1880 bis 1910 als diejenigen Kollektive untersucht, die Luftfahrtfaszination, Luftfahrttechnik und Luftfahrtforschung in Deutschland mit der Ballonfahrt öffentlich etablierten und legitimierten. In der Vereinsgemeinschaft wurde Ballonfahren als Massenphänomen, als Sport und Vergnügen einer bürgerlichen Elite und als neuer Forschungsbereich organisiert. Einerseits ein Ort der Performation von Konzepten bürgerlicher Männlichkeit, nationaler Stärke und wissenschaftlicher Rationalität, erwies sich der Verein andererseits als Katalysator der Produktion von Luftfahrtwissen und einer "Professionalisierung" der Luftfahrtforschung. Anhand der Entstehung der aeronautischen Meteorologie, der wissenschaftlichen Ballonfahrt zur meteorologischen Erforschung der Atmosphäre, wird der Prozess der personellen und organisatorischen Spaltung im Vereinswesen in den Jahren 1899 bis etwa 1905 nachvollzogen, der zur Verselbständigung und Institutionalisierung des Forschungszweiges "Aerologie" führte. Als international organisiertes Programm zeitlich und räumlich lückenloser Atmosphärenbeobachtung leistete die Aerologie einen Beitrag zu den imperialistischen, geostrategischen Konstellationen der Jahrhundertwende. Die Daten, die im Zuge der Serien- und Simultanballonaufstiege gesammelt wurden, eröffneten zugleich den atmosphärischen Raum und forcierten dessen Erschließung. Die Arbeit zeigt, dass meteorologische Expeditionen die Ausbreitung der Forschungsarbeiten über die Erdoberfläche etablierten, während die Universalität des gewonnenen Wissens die Omnipräsenz seiner Produzenten legitimierte. Die international organisierte Aerologie bevollmächtige und bestätigte die nationale Raumaufteilung in der Blütezeit des Imperialismus. Als "angewandte Wissenschaft" strebte die Ballonfahrt in Deutschland nach dem "Platz an der Sonne". 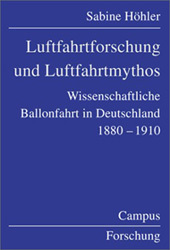 Sabine Höhler, Luftfahrtforschung und Luftfahrtmythos: Wissenschaftliche Ballonfahrt in Deutschland, 1880-1910, Frankfurt/New York, Campus 2001. This study was published by Campus .